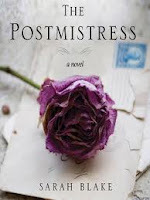 a book chick: "the postmistress"
my take: i gave this to my mother-in-law for Christmas hoping i'd get a chance to read it after she did ... and so nice of her to hand it to me when she was done. my friend julie says what would we do without World War II material for novels? ... with all the countries involved and the Holocaust, it's a treasure trove for stories and this one is from the perspective of Americans before the American involvement. This was a great beach read. Short(er) after the hefty Hummingbird's Daughter, easy to follow stories, and strong women. Very enjoyable.